Take atta in a mixing bowl. Heat water in a pan and add sugar to it.No need to melt the sugar completely. Add saunf, crushed cashew nuts to the flour. Now slowly add the sugar water to the flour and knead it. The dough should be dry and not soft. Mould them with your hand or use a cookie cutter to get desired shape of cookies. 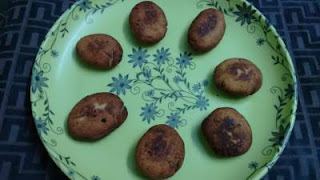 Deep fry the cookies or thekuas till golden brown. You can store them in an air-tight container for weeks.